We’d love your help. Let us know what’s wrong with this preview of A Sign of the Times by Lynn Machin. The King James Bible is a treasure-trove of idioms, clichés and phrases that have entered everyone's vocabulary-and yet few are aware of the Bible as their source. This book, suitable for both individual and group use, contains fifteen short studies designed to provoke discussion and contemplation. 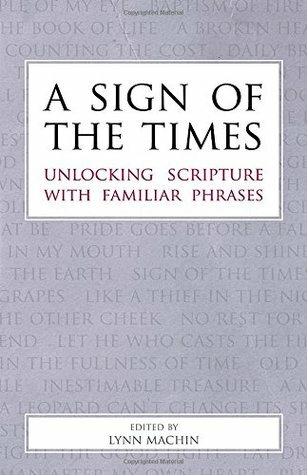 Each study discusses the context and cultural climate in which they were use The King James Bible is a treasure-trove of idioms, clichés and phrases that have entered everyone's vocabulary-and yet few are aware of the Bible as their source. This book, suitable for both individual and group use, contains fifteen short studies designed to provoke discussion and contemplation. Each study discusses the context and cultural climate in which they were used, and reflects on their relevance in the modern world. To ask other readers questions about A Sign of the Times, please sign up. I still have not received this book I won on June 17, would love to have this...thanks for any help...Mary?